The 3rd Army Corps was one of three corps the Italian Army fielded during the Cold War. 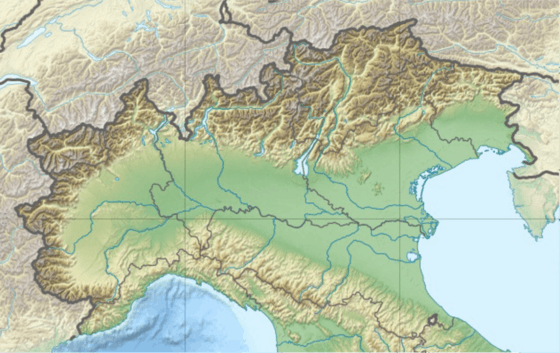 Based in the regions of Lombardy and Piemont the corps was the armys operational reserve, while the 4th Alpine Army Corps and the 5th Army Corps, both based in the North East of Italy were the armys front-line units. After the end of the Cold War the corps was reduced in size and on 1 December 2000 it ceded its last brigades to the 1st Defence Forces Command (COMFOD 1°). The personnel of the 3rd Army Corps was used to raise the NATO Rapid Deployable Italian Corps in January 2001. The history of the 3rd Army Corps begins after the second Italian war of independence. Following the Italian-French victory over the Austrian Empire, the Kingdom of Sardinia annexed the Papal Legations in present-day Emilia Romagna. Thus on 1 April 1860 the 3rd Higher Military Command was activated as a territorial command in Parma and tasked to defend the newly acquired territory between the Trebbia and Panaro rivers, an area roughly corresponding with the historic Emilia region. The command consisted of the 5th, 8th and 12th division of the Line. At the outbreak of the third Italian war of independence the command was renamed as III Army Corps and participated in the Italian Mincio campaign aimed at the Austrian Quadrilatero fortresses with the 7th, 8th, 9th and 16th divisions of the line. On 24 June 1866 the corps was one of two engaged in the Battle of Custoza. In August 1867 the III Army Corps was disbanded. However, on 14 June 1869 the III Army Corps was raised again in Naples and given territorial duties. Until the outbreak of World War I the corps remained as a territorial command in Italy. After the Italian declaration of war against the Austrian Empire on 23 May 1915 the III Army Corps under Lieutenant General Vittorio Camerana advanced on the extreme left flank of the Italian Army through the Valtellina, Camonica Trompia and Chiese valleys and along the Western shore of Lake Garda into Trentino. Although numerically superior the corps failed to cross the Stelvio and Tonale pass and advanced only until Riva del Garda and Tione, but failed to take either of the two cities. The corps consisted of the 5th and 6th Division of the Line (Infantry), the 35th Territorial Division, the 7th Bersaglieri Regiment and the 5th Alpini Regiment. All soldiers of the 5th Alpini Regiment had been recruited in the aforementioned valleys and thus fought in a territory they knew perfectly well. However the 5th Alpini Regiment was never employed as a whole, but single companies or battalions were given specific mountain summits, ridges or passes to conquer and hold. After the initial advance had been brought to a halt by the Austro-Hungarian Army the corps dug in and, although fierce fighting continued - especially on the Adamello glaciers - the front in the corps' sector remained almost unchanged until the end of the war. The front became so static that the 35th Territorial Division was sent to participate in the Allied war effort in Macedonia. After the Italian defeat in the Battle of Caporetto the III Corps was taken out of the front and became the Armys reserve corps, tasked with countering any enemy breakthrough on the Piave front during the winter of 1917/18. In spring of 1918 the corps returned to its original area of deployment. After Austria signed the Armistice of Villa Giusti the III corps finally advanced into Trentino. After the war the III Army Corps returned to its garrison in Milan. After the drawdown of forces in the early 1920s the corps consisted of the 6th Infantry Division Legnano in Milan, the 7th Infantry Division Leonessa in Brescia and the 8th Infantry Division Po in Piacenza. In spring of 1936 the corps was sent to Eritrea to reinforce the Italian troops that faced stiffer than expected resistance during the Italian invasion of Abyssinia. The corps commanded the 27th Infantry Division Sila, 2nd Blackshirt Division 28 Ottobre and a brigade sized formation with light tanks. The corps fought in the First Battle of Tembien, Battle of Amba Aradam and Second Battle of Tembien. After the return to Milan the corps was given the task to defend Italy along the Swiss-Italian border. To aid in its task the corps was given command of the Alpine Wall fortifications in its area of operation. When Italy declared war on France on 10 June 1940 the corps was near the French-Italian border in Limone Piemonte. The Italian Army only performed limited patrols and remained in its positions until after France had asked for an armistice on 20 June 1940. The next day the Italian divisions crossed the border in force, but stiff French resistance stopped them along the entire front after a few kilometres. During the campaign the corps commanded the 3rd Mountain Infantry Division Ravenna, 6th Infantry Division Cuneo and a mixed unit of four Alpini and two Mountain Artillery battalions. After the Italian invasion of Greece in October 1940 bogged down under stiff Greek resistance the III Army Corps was dispatched to Albania to augment the Italian forces along the Macedonian front. The corps commanded the 19th Infantry Division Venezia, 36th Mountain Infantry Division Forlì, 48th Infantry Division Taro and 53rd Infantry Division Arezzo and the 4th Bersaglieri regiment as Corps reserve. All Italian attacks were repulsed by the Greeks until German forces invaded Greece through Bulgaria and cut the Greek Armies on the Albanian front off. Afterwards the III Army Corps advanced to Thebes where it remained on garrison duty until September 1943 when it surrendered to German forces after the Italian-Allied armistice. On 15 June 1945 the III Territorial Military Command was activated in Milan which at the time controlled only the Infantry Division Legnano in Bergamo. The Legnano was a unit of the Italian Co-Belligerent Army and had served on the Allied side during the Italian campaign. Following service with the American 5th Army, the Legnano served with the Polish II Corps on the extreme left of the British 8th Army. When the corps regained its historic name on 1 July 1957 it included besides the Legnano the Armoured Division Centauro in Novara, the Infantry Division Cremona and Alpine Brigade Taurinense both in Turin. In 1972 the Taurinense was transferred to the IV Alpine Army Corps. The corps - along with the 4th Alpine Army Corps and 5th Army Corps was part of NATOs Allied Land Forces Southern Europe Command (LANDSOUTH) in Verona. Each brigade, with the exception of the Centauro, fielded about 4,700 men. The Centauro fielded about 3,400 men and together with the corps' support units the entire corps fielded over 40,000 men. In 1982 Bersaglieri of the Legnano brigade were deployed in Italys first operation outside its soil since World War II as part of the Multinational Force in Lebanon. With the end of the Cold War the Italian Army began a decade long reduction of its forces. The first brigade to disband was the Goito on 1 June 1991, followed by the Brescia on 27 July 1991. Also on 1 June 1991 the Trieste ceased its colours in Bologna and in its stead the Mechanized Brigade Friuli arrived from Florence. The Friuli took command of some units of the disbanded Trieste and entered the ranks of the 3rd Army Corps. In September 1993 the Legnano brigade deployed to Somalia in support of United Nations Unified Task Force mission. In spring 1997 the Corps assumed responsibility for Operation Alba, the first multinational mission led by Italy, in the wake of the Albanian Rebellion of 1997. However already on 1 December 2000 it ceded its last brigades to the 1st Defence Forces Command (COMFOD 1°). The personnel of the 3rd Army Corps was used to raise the NATO Rapid Deployable Italian Corps in January 2001.